Curious about what your fellow citizens plan to do in the persistent universe? Check out the Galactic Census. I recall participating a few months back and now the results are available for viewing. Exploration, Trader, Transporter, Merc and Other, round out the top 5 professions in the survey. Curiously, most everyone wants to do some level of exploration, even those who haven’t thus far pledged for a ship capable of doing exploration. Perhaps they’re reflecting their desire to see new sights and travel the less traversed paths of the persistent universe. I suppose that shouldn’t be too surprising given the expansive and intricate world that Cloud Imperium Games is developing. It appears that I’m not alone in planning to pursue multiple career paths. I still don’t even know what I’ll start with when the game goes live. It’s likely to be one of my smaller ships to get the lay of the land since I’m cautious about playing too much in alpha and beta. I try every patch when it first releases and then I stop playing. I like to save as much as possible for the live game and ensure that I don’t burn out early. Have you decided which career path you’re going to focus on first? If you plan to participate aboard multi-crew ships what roles are you most interested in doing? 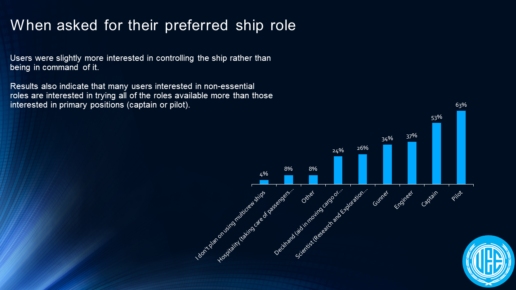 Like the survey, I’m less interested in flying the ship as well. I like to be free to document the adventure by taking screenshots, video and the occasional note. That’s hard to do if you’re in control of the vehicle or a primary combat role which is why I prefer not to be either in MMOs. For me, chronicling my journey is as important has having experienced it.